An easy-to-carry "pocket book" that steers women away from the world's weak remedies for anxiety and fear and points them to their security in Christ. While fear-provoking headlines fill our days, and struggles with anxiety are a fact in a fallen world, Scripture says fear does not need to be a fact of life for Christians. This little carry-along "pocket book" for women focuses on the Bible's great truths about what lies beneath their fears and the means to overcome them-for those who worry just a little, those who suffer a gnawing, controlling fear or actual panic attacks, and every woman in between. 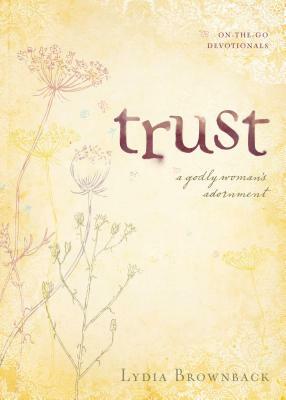 The first in a series of small, Bible-centered volumes for women, each of which covers a particular struggle, Trust is full of biblical truths and promises that will reassure readers that if they belong to Christ, they have absolutely nothing to fear. On-the-Go Devotionals easily tuck into a purse or gym bag and make great gifts. Each lesson is self-contained, with Scripture and a paragraph or two of teaching that will steer women away from worldly coping techniques, away from themselves and their circumstances, and onto God and their security in Christ.